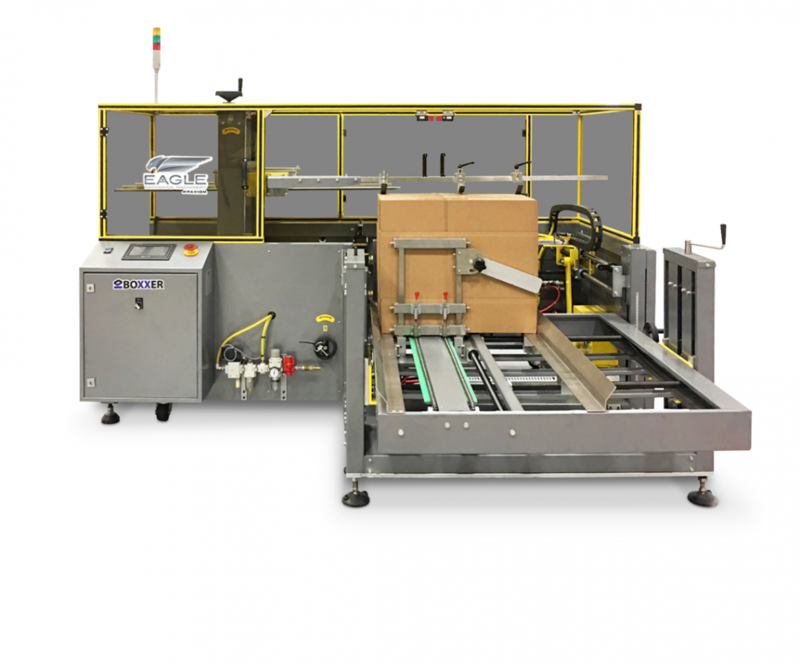 BOXXER T12 and BOXXER T18 automatic case erectors are designed to efficiently erect and seal both regular slotted and half slotted cases with high-strength tape. The BOXXER line of case erectors now comes standard with high capacity powered hoppers for continuous automatic loading. Over 300 corrugated blanks can be staged on the magazine and automatically fed, one by one, to the machine with no user interference. New hopper design incorporates a straight-line positive automatic infeed as opposed to the gravity-dependent declined ramp system. BOXXER case erectors are constructed in durable welded steel and offer a compact footprint and easy mobility in limited-space production facilities. Additional standard features include an easy-operate color touch screen, quick-change over mechanisms, right or left hand machine execution, leveling pads, auto-idler, and PLC.